The AACS/CEA group rates start at $99/night (Sun-Tues) & $149/night (Fri-Sat) (+ resort fee). Click here to book your room now. 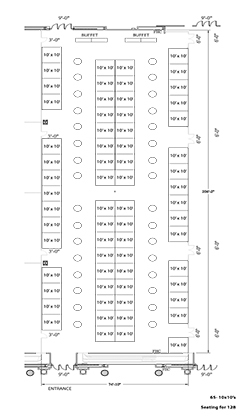 Each 10'x10' booth includes two (2) participant badges. Exhibitor badges allow for full access to the CEA & AMP Annual Convention (including all Sessions, Meals, and Activities). Click here to view an updated floorplan. Additional badges can be purchased at a discounted exhibitor price of $275.00. Note: Due to the security standards set forth by MGM Grand Las Vegas and AACS, we need a complete list of all persons attending. Please ensure ALL names are listed on the form below. NO ONE will be admitted without a valid name badge. If you've already purchased & selected your booth, and are now interested in sponsorship opportunities, please click here. Available to AACS Partner Members only. *Membership will be validated before booth is confirmed. 175 If you wish to have a premium corner location, please select this option. Booths will be available to non-members soon. Please check back or contact Gilbert Munoz for more information. 210 If you wish to have a premium corner location, please select this option. Click here to view the most up-to-date floorplan. Looking for ways to increase your exposure at the 2019 CEA & AMP Convention? Maximize your presence in Las Vegas by sponsoring one of the additional opportunities below.